Back in December we had several automotive journalists come to Detroit for some product events with Ford and General Motors. This provided a great opportunity to organize a Tweetup (learn all about what a Tweetup is here if you don't know.) 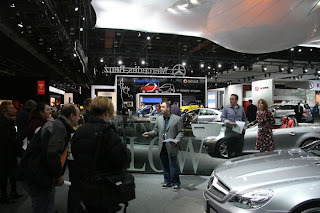 During the planning, one of my followers on Twitter, @Muntz_Man, contacted me about joining the event and mentioned maybe there could be another event during the auto show where the Twitter community could come to see the North American International Auto Show (NAIAS) in a more exclusive way. What I soon found out is that Max Muncey is an Associate with the John Bailey & Associates Public Relations firm working with NAIAS. Once auto show week arrived, Max reached out again and there was a tweet from the @NAIASDetroit Twitter account inviting people to an event. 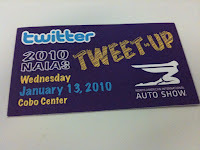 I joined in as did some local social media and automotive people who attended to the first ever NAIAS Tweetup on Wednesday January 13, 2009. The event was held a few days before the public opening and fell on one of the Industry Days. Industry days are basically what it sounds like, a time for people in the car business - engineers, designers, marketing people - to get a look at the cars and displays usually for work related reasons. The show itself is great. Far better than last year where GM and Chrysler were held up by a shoestring as Presidential administrations were changing and George W. Bush had only given the auto companies enough to survive day-to-day. This year the displays are bigger and better with a strong presence by Ford Motor Company and a surprisingly elaborate display from the Chrysler Group; even though, Sergio Marchionne supposedly doesn't see much value in auto show marketing. Of course, there are not the crazy, design exploration concept cars of years back. Today most manufacturers show "concepts" that are basically 90% completed production vehicles. The one concept that did impress and was a bit more of a study than reality is the Audi E-Tron concept. It is beautiful. One interesting note to this year's auto show is a new thing Ford, Lincoln, Mercury is trying with giving product specialists their own Twitter accounts. You can view their accounts at Sam DeLaGarza's Twitter List; Sam is the Ford Fiesta Brand Manager. Bringing product specialists from an auto show to Twitter is definitely something new. We'll have to see if it catches on and becomes an unique way to engage with the show online; though, I do worry it also becomes a platform to be "that guy." If you want a less corporate perspective from the product specialists, checkout a new blog and Twitter account (@DYCWTC) from an anonymous GM auto show model. Her post on "Grandpas" is an interesting take on what it's like to be trapped by the Greatest Generation. NAIAS opens to the public tomorrow and has its final day on January 24th. If you are in town, it is definitely worth checking out. I go 2 or 3 every year and will probably even head out again for a public day thanks to some free tickets Mercedes-Benz sent me. I had assumed so from a Tweet of yours saying You are not the President of GM with me thinking this was something you kept hearing. It doesn't really matter who you work for, what's more important is the unique perspective you bring to automotive blogging. It is appreciated by this industry follower.